Apple iPad can not only be used to play games but it can serve as an information tablet too. For instance, you can use it as weather information tablet. Thanks to apps such as Living Earth HD, you can keep up with the latest developments (weather-wise) in your location and plan ahead of time more effectively. Living Earth HD’s world clock means you’ll be covered no matter where you’ll be traveling to. Living Earth HD provides you with live 3D simulation of the Earth. 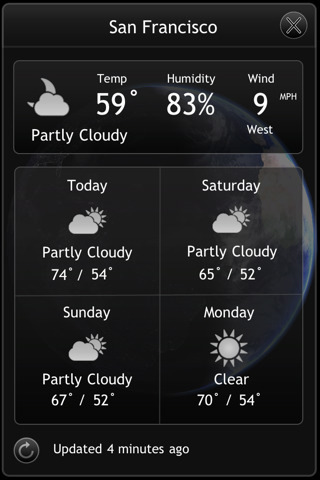 It offers you global weather information, forecasts, and times in cities around the world. It does have a shiny look, making it a perfect nightstand application. 22,000+ cities are covered in this app, offering you a pretty comprehensive experience. Living Earth HD gives a whole new meaning to keeping up with weather and times around the world. It shows you sunrise and sunset borders as they happen. You can also observe the change of seasons on your iPad. Clouds also show up on your mini planet. 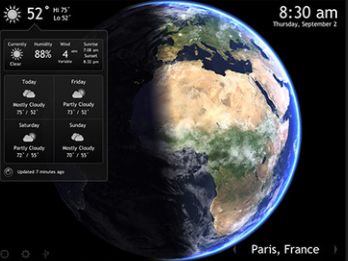 Living Earth HD is a world clock meets a weather app. It has plenty of cities in its database and keeps you up-to-date with the latest weather information. It’d be even better with an alarm feature.